1931, Pan Am president Juan Trippe requested proposals for a passenger aircraft capable of crossing the Atlantic Ocean to Europe, a distance of around 2,000 miles from Newfoundland to Ireland. This was just 4 years after Charles Lindbergh’s pioneering flight and aviation technology was barely up to the task, and only two responses for flying boats were forthcoming – one from Sikorsky for their S-42, the other for Martin’s Model 130. 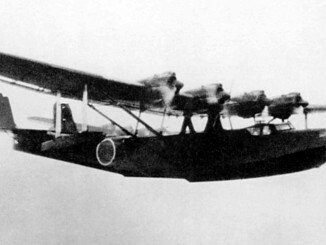 The S-42 was a more conventional design for the time, but lacked the capability to carry passengers on trans-oceanic flights. 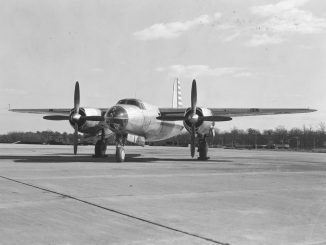 The Model 130 was a larger design, with more powerful Pratt & Whitney R-1830 engines and larger fuel capacity which gave it the range to cross the Atlantic or to fly from California to Hawaii. It had space for a maximum of 36 passengers in ‘day’ configuration, or half that if sleeping accommodation was required for the long Pacific crossings. Just three of the flying boats were built, although an enlarged Model 156 was also constructed before being sold to the Soviet Aeroflot. The first flight of the Model 130 took place in December 1934, with deliveries to Pan Am in the following year. The first commercial airmail flight occurred in November 1935, with an estimated 250,000 Filipinos welcoming the China Clipper as it arrived in Manila after a 6-day trip. Weekly trans-Pacific flights were scheduled, with the first leaving San Francisco with 7 fee-paying passengers in October 1936. Pan Am constructed hotels on Midway Island, Wake and Guam to provide accommodation for passengers on the San Francisco-Manila route. 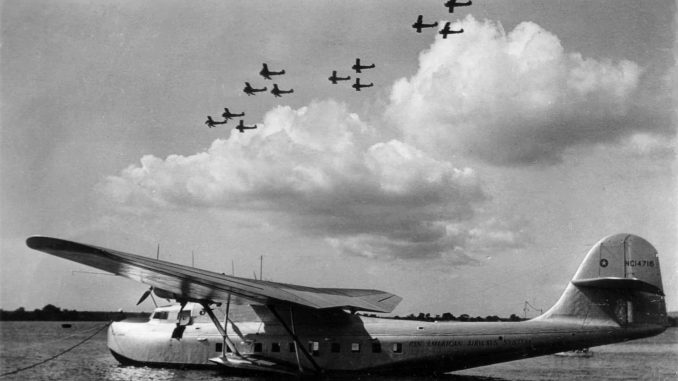 In 1938 Hawaii Clipper vanished during a scheduled flight from San Francisco to Manila. The plane had arrived at the stopover point of Guam with no issues reported, and departed for Manila on the 28th of July. Several hours into the flight, Hawaii Clipper reported ‘rain static’ by radio – this turned out to be her final transmission, and she never arrived at her destination. No trace was ever found of the aircraft, although an Army transport did encounter an oil slick whilst attempting search and rescue effort. 9 crew and 6 passengers were lost. A Model 130 on the regular Pacific run was moored at Wake Island on 8th December 1941 when the war began – the Philippine Clipper was strafed by Japanese bombers and received 76 bullet holes, although no serious damage was done. The aircraft safely escaped back to Hawaii later that same day. 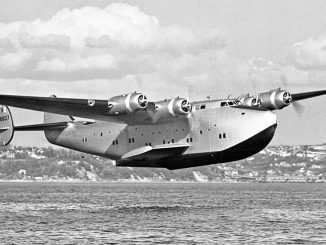 On 21st January 1943, the Philippine Clipper crashed in bad weather attempting to land at San Francisco. All 19 passengers and crew killed, among them RAdm Robert H. English, then-commander of the Pacific submarine fleet. The last surviving Model 130, the China Clipper, was later returned to Pan Am service, only to crash whilst landing at Port of Spain, Trinidad, on January 8th 1945. 23 of the 30 people aboard were killed.